New Mills is not fashionable. The Indian restaurant occupies as much space as any of the other shops. Before it was destroyed by flood the Sycamore was a fine pub but now you have to climb a hill to the out of town but nearby Pack Horse for decent beer and food. The Arizona pale bitter there is special. When my father was made redundant and left Merseyside to work in Stockport, he wanted to buy a house in New Mills. The countryside of the Peak District tempted but pragmatism made him settle for Bredbury outside Stockport. Like my father, Thomas Handford liked a pint. When he drank, he was troublesome to the town, Handford not my father. But after being teetotal for ten years, Handford bought and converted the local prison into what was described as a ‘comfortable dwelling house’. The area has a strong Methodist tradition and some religious sites, so perhaps redemption always beckoned Handford. 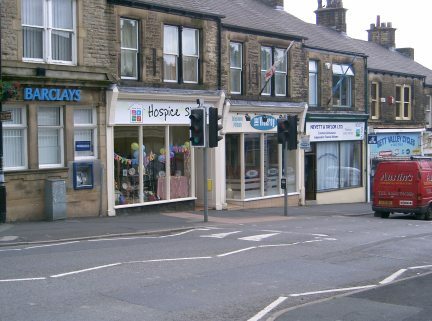 New Mills has a population of 10,000. It prevails as a problem free community thanks to the presence of Swizzles Matlow. The company makes sweets and is famous for Love Hearts. These heart shaped temptations have encouraged more than a few fantasies in British children. Of course, what they did to British teeth may have condemned those fantasies to be just that. The children of New Mills were supposed to have been used to test the products and they may have fantasised or suffered more than most. Now that Cadburys is owned by Americans, Swizzles is the largest British owned confectionery company in Britain. Every day several tankers arrive at Swizzles. Each tanker holds twenty tons of sugar. Eighty years ago Swizzles bought a redundant cotton mill. The presence of water and coal gave the town potential for industry. Agriculture, mining and the cotton mills obliged the hamlets of New Mills to become a town and to be regarded as significant. New Mills is linked to the A6 trunk road, three railways and the Peak Forest Canal because the businessmen of the 19th Century needed what the people of the small town produced. These transport links continue to exist but the last of its cotton mills closed at the beginning of this century. It lasted 200 years, which is more than most. The forty pits are all closed. 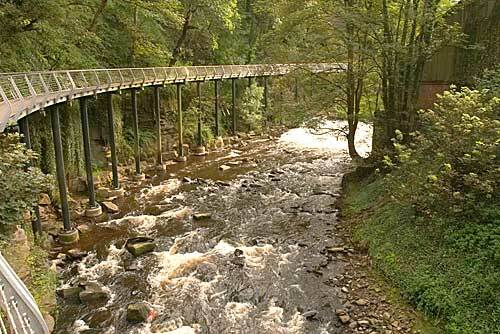 New Mills is located above a gorge called the Torrs. Someone decided to build a millennium bridge through the gorge. This happened because the Torrs is on the E2, which is a premier walking route across Europe from Stranraer to Nice. The walk around and below the town is spectacular. New Mills has an annual bonfire. In 2013 this attracted 3000 people, which must be as many people as those who attend contrived firework displays in cities. Every year a two week festival celebrates the community. Folk in Manchester fifteen miles away may not think the mix of music, talks and exhibitions worth the journey but the lantern procession through the gorge, and the sight of the millennium bridge lit at night, will remain in the memory of those who visit. Posted in Arizona Bitter, Bredbury, Cadburys, E2 route, Love Hearts, New Mills, Peak District, Peak Forest Canal, Stockport, Stranraer, Swizzles Matlow, The Torrs Peak District, Thomas Handford, Treat Me Nice and tagged Culture, tourism, travel, UK, UK history on August 22, 2015 by Howard Jackson.